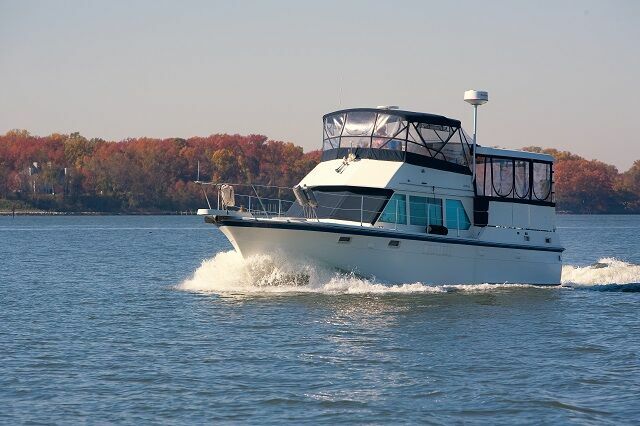 Phase Two is a 1973 38′ Hatteras Double Cabin flybridge Motoryacht. She offers a full Eisenglass enclosure on the flybridge and sundeck, twin naturally-aspirated 280 hp Detroit Diesel main engines by Johnson & Towers, dripless shaft seals, spare propellers, 8 kW generator, Magnum inverter, Vacuflush heads and a 2 stateroom 2 head layout. Great Loop capable. See the movie and 3D images below. Contact Curtis Stokes via Email or call 954-684-0218 for more information and an appointment to view this 38′ Hatteras motor yacht for sale.